The convention itself takes place in “Port Raleigh”, an aether and nautical port that is constantly travelling through space/time and is only able to stabilize its location for short periods of time. Each year, attendees will follow the crew of the ship ConTemporal and their adventures through time and space searching for the technology — or artifacts — they need to permanently stabilize the port. Their travels and the port’s temporary stabilizations will continuously influence décor and technology so look for the con to grow and change over the years. That story, that background, really helped shape the entire convention. As I said on Twitter, for a first-year con, it was amazing how much of a distinct personality it had already developed. On Saturday was High Tea, which many con-goers elected to attend for a small extra fee. Everyone was seated in groups of eight for tea, and roleplayed their parts on ConTemporal. The captain of the ship was there, along with the Toastmistress, Lee Martindale. My two brothers, my fiancé, our two friends, and I were seated with two people we hadn’t met. The gentleman, Professor Bottomly, seemed to be an unusually good roleplayer and surprised us when he stood up to loudly interrupt a doctor of phrenology, who was giving a lecture on the nature of his field of study. I believe all the actors at High Tea were from the Intrigue Factory, and they helped lend credence to the event. Although the writing track was a little weak (it was its first year, of course), I learned a lot from scifi writers like Mark Van Name. There was also an excellent Baen Books seminar, which really opened my eyes as to what life inside a traditional Big Six publisher is like. The Makers track was where the real fun happened. 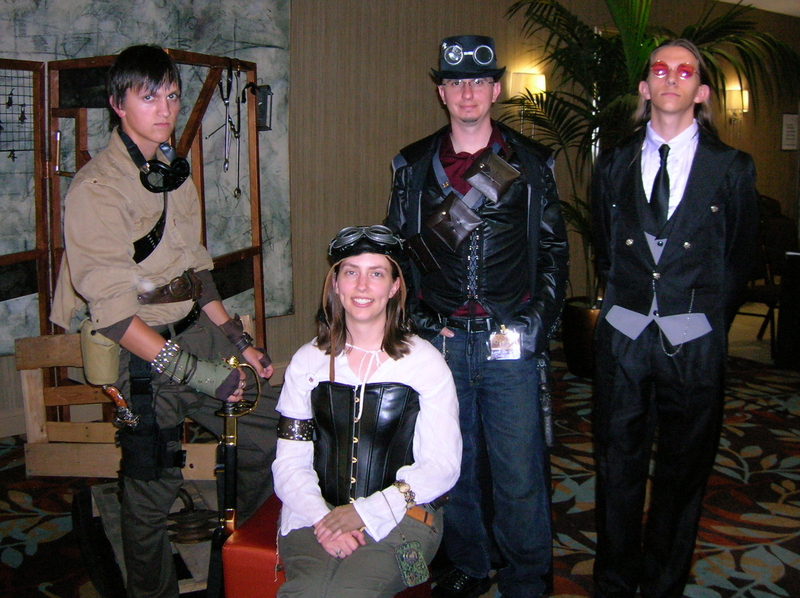 Appearances from Hatton Cross Steampunk, Penny Dreadful Productions, and Brute Force Studios made every panel in the Makers track worthwhile, giving tips on everything from how to dye fabrics to where to find materials for a good ray gun. My brothers especially found these panels fascinating. What made ConTemporal most fun for me was attending it with friends and family. A convention is just infinitely more fun when you have pals with you whose minds are also blown by amazing costumes like this one from Penny Dreadful. It’s with fond memories that I will look back on the first ConTemporal. Being around so many people (about 500, in fact) who share the same interests and who geek out without any reservation or self-consciousness is great fun. Please check out more great ConTemporal photos on my Google+ (yes, you can see them even if you don’t do the whole social media thing). And if you do enjoy social media, then come find me on Facebook, Twitter, and Goodreads and tell me what scifi or steampunk cons you plan to attend. Great Show-Had a great time with wonderful people!